Nicole Kidman is one of the most successful and beautiful actresses of Hollywood. Her lovely smile spreads warmth to the audiences watching her on screen. She has been a style icon for generations. We have seen a lot of changes in her hairstyles. If you look at her picture from the early days, you will notice that she loved curly hairs. Those golden ringlets were the signature style of this actress. The voluminous hair became the most prominent feature of her beauty. In 1993 she was seen in a teenage-like style with two long loose braids on either side. She looks great with her signature blonde hair. She has often opted for the straight and simple look with some bangs in front. Occasionally, she even makes lovely soft curls to her long hair. It looks great on her. She has gone for the short hair look also. She had soft waves and suited her face well. The hair was parted in the middle. In 2003, she cut her hair short and had chin-length ringlets. It really suited her facial features. She was seen in wavy faux bobs at the Grammy Awards in 2010. She had strawberry blonde long hair in 2014. In 2017 she looked very trendy in the platinum colored straight hairstyle. Here’s Nicole Kidman’s hairstyles over the years. Kidman kept a simple yet classy vibe in a deep side-parted low ponytail with side-swept bangs as she attends the 3rd "Gold Meets Golden" on February 21, 2015. This shoulder-length curly bob tresses of her is certainly a sophisticated glamorous look at the Women In Film 2015 Crystal + Lucy Awards on June 16, 2015. Nicole revealed her straight medium-length bob for the photocall 'Queen of the Desert' event on February 6, 2015. The Australian actress exuded charm in a trendy messy side braid for her blonde locks at the 'Top Of The Lake: China Girl' Photo-call on May 23, 2017. She looked timelessly elegant wearing this loose middle-part waves at the AFI FEST 2016 "Miss Sloane" World Premiere Special Screening on November 11, 2016. The actress paired her sophisticated makeup with a low, twisted updo with long parted bangs framing her face at the 22nd Annual Critics' Choice Awards on December 11, 2016. 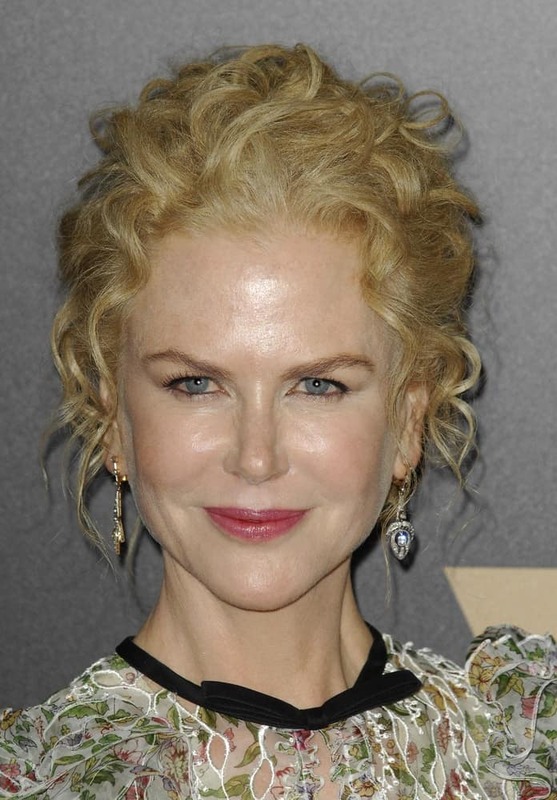 At the 20th Annual Hollywood Film Awards on November 6, 2016, Kidman wore her curls in a loose up-do with a few pieces hanging down. The Australian beauty wore her blonde locks in big loose curls at the premiere of The Family Fang movie on April 16, 2016. Nicole's braided crown with a few long-side bangs is alluring and glamorous at the 2016 MET Gala on May 2, 2016. Her shoulder-length blonde hair was styled in tousled waves LION AFI Fest Premiere on November 11, 2016. The Australian actress started her career in Australia in 1983. She acted in the film Bush Christmas. The thriller ‘Dead Calm’ became a big success and she became a prominent face in Australia. She started her Hollywood career with the film ‘Days of Thunder’ opposite Tom Cruise. She then kept on acting in numerous films and becoming a successful actress. Some of her noted films include Batman Forever, Eyes Wide Shut, The Compass, Moulin Rouge!, Cold Mountain, Lion, etc. She has won numerous prestigious awards throughout her career including the Academy Award, Golden Globe Award, BAFTA Award, SAG Award, and more. She is the Goodwill Ambassador for the UNICEF and the UNIFEM. Kidman is also a producer and has produced good films like Rabbit Hole and Big Little Lies. She won awards for these films. Kidman is one of the best Hollywood actresses of all time and she has also been the highest earning actresses. She is very talented and has worked hard to achieve whatever success she has today. She has many upcoming projects in hand and will continue to act in films and produce them as well. She has worked with very talented directors and it helped her to learn more about acting. She is a very strong and talented actress who will continue to entertain us for many years.